"This cake recipe uses sourdough starter in the batter for a uniquely delicious cake with a strong milk chocolate flavor." Sift together flour, cocoa, soda, baking powder, and salt. Cream shortening, sugar, and eggs. Blend in sourdough starter. Add sifted ingredients slowly to creamed mixture, beating until smooth. Stir in water and vanilla, and mix well. Pour batter into greased and floured 9 x 13 inch pan. Bake at 350 degrees F (175 degrees C) for 35 minutes, or until done. My husband absolutely loves this cake! We took one of the reviewers suggestions on keeping it in the fridge and that makes it even better. Thanks! This didn't work out for me at all, and I really followed the recipe. I don't know why it turned out so dry. I doubt I'll make this again. 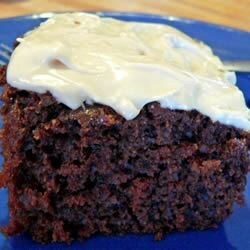 This is such good cake,the only thing it needed was 1/2 cup sour cream to make it moist and I also keep it in the fridge. Per other reviews, I used canola oil, decreased flour a tad, added more cocoa, used buttermilk in place of water. This makes a nice tall cake... and the batter tastes tangy and amazing!